The Madballs by the Amtoy company bounced onto the scene in the mid 80's. These novelty balls with disgusting faces and names (like Dust Brain, Skull Head and Snake Face) became a runaway hit with boys of all ages. With their hideous but comical faces, the Madballs helped to establish a toy era where wacky characters (like these and the Teenage Mutant Ninja Turtles) would begin to lure kids away from the standard fare of action figures and space toys. The Madballs even got their own Marvel comic book line which lasted a year. Launched in 1986, the comics helped showcase the 2nd season's characters - Lock Lips; Splitting Headache; and Horn Head. The new series sold well but were already beginning to loose their appeal with fickle children. 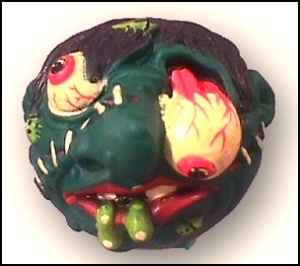 In late 1986 the figures were released as 4-inch poseable figures known as Head Popping Madballs. Now Madballs had wretched bodies to match their grotesque faces. They also featured self-launching heads via a spring mechanism in the bodies. This function never seemed to work consistently. The new line also were intended to be used for Good versus Evil character play but even children saw through this marketing stretch. By mid-1987 the Madballs craze had run it's course and children were turning to Teenage Mutant Ninja Turtles. You can find Madballs on auction on sales and auction sites today for around $5, though mint examples are tough to find. The 4-inch figures are a little harder to find. While Madballs were made over a decade later than Wacky Packs, Odd Rods, Nutty Mads and other toys of questionable taste, kids from the '80s will always cherish characters like Screamin Meanie; Occulus Orbus; and Slobbulous.